MEGA Bloks time again, guys; this time back once again in the disconcertingly violent world of Call of Duty. 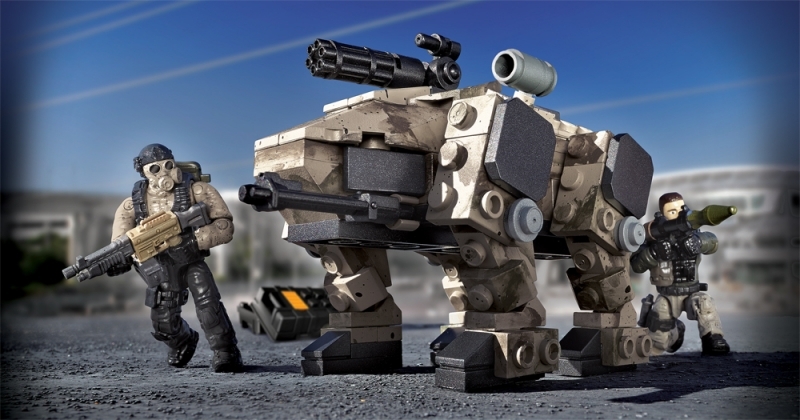 The Claw Assasult set features two micro action figures, a tonne of accessories, and The Claw itself, a sort of walk-along giant-dog mini-tank thing. The set includes 212 parts and took us about half an hour to complete. Let's dive in. Although the ODIN Space Station set was a joy to behold, the figures were quite unique to that particular model, so the guys included here actually felt like our first 'proper' look at Call of Duty figures. As we wrote in the ODIN review, COD figures do slightly differ to the ones from the Halo range, and typically come equipped with LOTS of accessories. The two figures are marvellously detailed and each very different. The guy on the left is sporting a fetching gas mask, while the man on the right clearly laughs at the notion of a helmet or face protection. This is only war, damn it! Here we've posed them up with a few of their accessories and weapons, but the posible combinations of belt clips, guns, backpacks and bits are huge. Check out the swag! 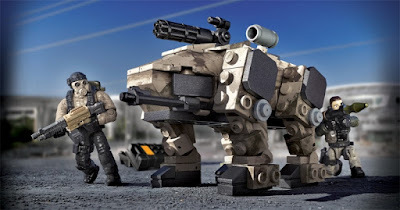 As well as accessories as varied as a spade and a hipflask, the machine gun has removable parts, and the rocket launcher has three spare rockets. As well as the above each figure also comes with a thigh belt. The figures use the same highly articulated system as the Halo and Assassin's Creed ranges, but as the subject matter of Call of Duty is set more in our world, they appear far more realistic. There are connection clips on the belt, the vests, on the thigh belt, and there is also a hole on the figures' backs for backpacks. We think they both look great, and when tooled up they really do look like soldiers. Onto The Claw itself. This is a bit of a beast to build, not because it is so big, but due to it being fiddly. Most of the 200+ parts go into this relatively small thing, and the feet especially are very intricate and extremely 'MEGA Bloks', i.e. weird shaped parts used in all directions. The Claw is a stocky, ungainly thing, and this model is actually somewhat bigger than the 'real' in-game version. Still, the top machine gun tilts and rotates, and all four legs are fully positionable. The legs are the same on each side, so building them wasn't as laborious as it could have been. Here you can also see the wonderful textured plastic used for The Claw's parts; a dark beige speckled with grey and brown. It is very militaristic and looks naturally weathered. And what is the point of having all those awesome accessories if you've got no place to stick 'em? The back section of the vehicle opens up to reveal a spacious boot-like storage area, here demonstrated by a very proud owner. "Room for the kids in the back." The Claw does indeed look a bit dog-like, and so can therefore be posed like a begging dog. If you want a robotic dog with a Gatling cannon on his back begging at you, that is. Christ's sake - give that dog whatever he wants! "That's right, Chris. Use the spade to dig our enemies into submission!" In terms of playability, Claw Assault is a great set with a lot going on for kids. Adult collectors will also love the figures, while The Claw itself is just weird and intriguing enough to make a great desk model. "Dear diary... Today Chris was mean to me. He is such a boy."